Here is the final review of the month of May. The third time is definitely the charm with Hyrule Warriors: Definitive Edition. SuperPhillip Central storms the battlefield with its in-depth review of this Nintendo Switch Dynasty Warriors-themed delight. 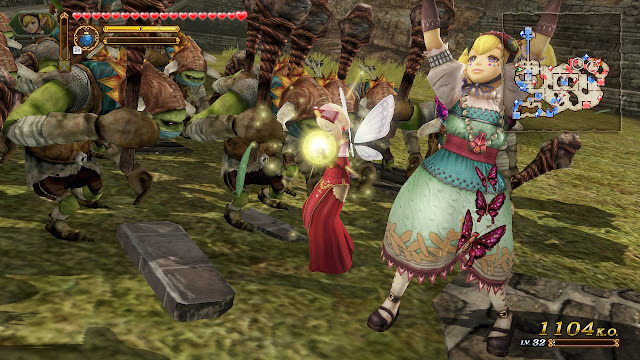 I greatly enjoyed my time with Hyrule Warriors when it originally released on the Wii U. The game already came packed with content, characters, and scenarios to play through and engorge oneself on. Then, Koei Tecmo continued to provide content for the game in the form of new characters, weapons, costumes, and Adventure Mode maps via DLC. If that wasn't enough, the Nintendo 3DS release, Hyrule Warriors Legends, brought even more new content in the form of brand-new scenarios such as Linkle's Tale, Cia's Tale, and a multiple mission scenario based off The Legend of Zelda: The Wind Waker. The only problem with the Hyrule Warriors Legends was that the Nintendo 3DS, even in New Nintendo 3DS form, just wasn't capable enough of a platform to showcase a game with myriad enemies to slay and destroy. Between the less than stellar frame-rate and the lack of as many enemies on screen as its big brother Wii U version, Hyrule Warriors Legends wasn't the most satisfactory way of playing Hyrule Warriors on the go. Enter the Nintendo Switch and Hyrule Warriors: Definitive Edition. The subtitle isn't just there to make the name sound pretty. 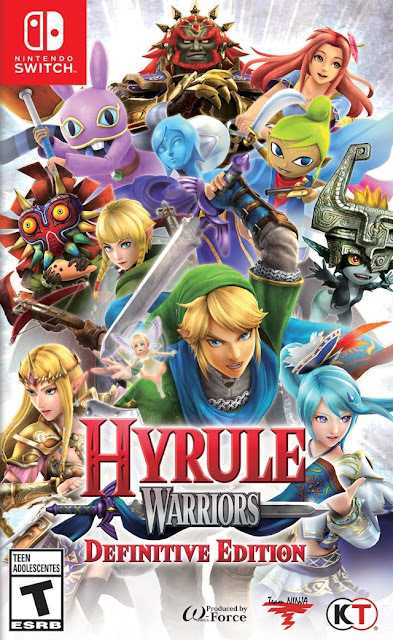 It really is the definitive edition of Hyrule Warriors, sporting all of the content, characters, costumes, Adventure Mode maps, scenarios, weapons, and features of both the Wii U original Hyrule Warriors and the Nintendo 3DS' Legends, including the latter's My Fairy. 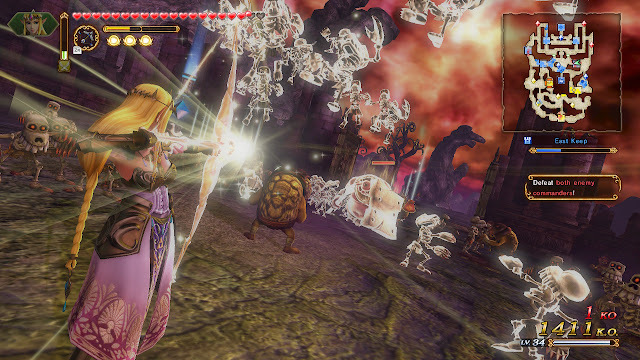 Hyrule Warriors: Definitive Edition is a beast when it comes to content, and it keeps its satisfying gameplay that made the game so beloved by both The Legend of Zelda and Dynasty Warriors fans. Link's fashion sense for this battle is decidedly retro and old school. 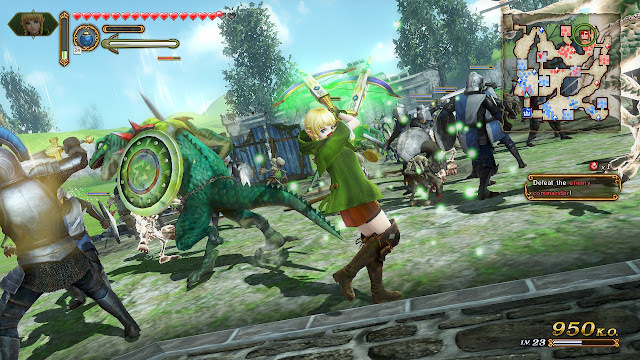 Hyrule Warriors is all about eliminating as many foes as possible with all-stars from The Legend of Zelda series, in addition to several all-new characters specifically created for the game. K.O. counts racing up to the thousands is easily achievable by just how many enemies are on display at one time on the battlefield. While fighting foes, the goal is to capture keeps by eliminating enemies within them and then defeating the keep's boss in order for your side of battle to control it. Of course, the enemy's forces also plan to accomplish the same goal and make sure your mission is a failure. This is performed by the enemy defeating you or one of your captains in battle, having your allied base taken over by the opposition, and letting a specific target perish mid-fight. with the arrows from her twin crossbows. While it's true that sometimes battles can be won by pure button-mashing, there is an elegance to combat to take note of. Combat is as simple as combining weak attacks with strong attacks to create different combos. The more times you press the weak attack button before you perform a strong attack determines which combo you use. The combos used, however, need to be smartly used on later difficulties. Many can leave your warrior open to attack or caught in a compromising position in battle. Avoiding attacks from enemies is also key, so careful evasion and watching for enemies when they wind up attacks so you can counter them after the fact for maximum damage is something to factor in fights as well. Impa is about to give Darunia one serious surprise attack from above. Legend Mode follows a new tale in The Legend of Zelda franchise, combining multiple characters from the series' mythos into one story. 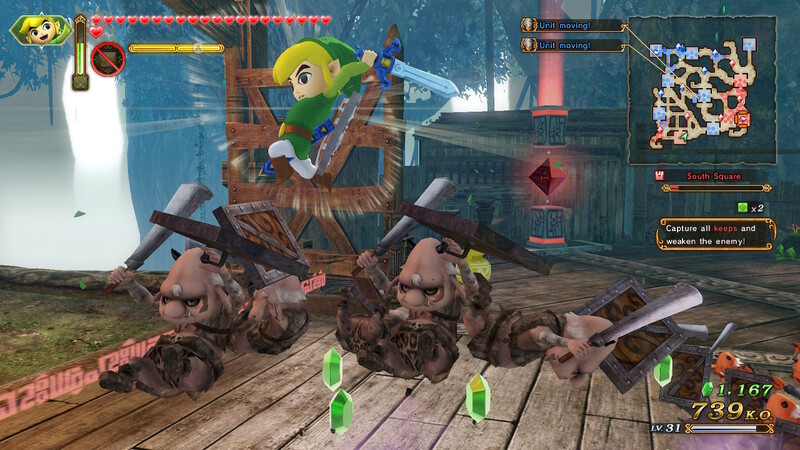 This is where Linkle's Tale, Cia's Tale, and the Wind Waker scenarios from Hyrule Warriors Legends take place. Nevertheless, the most interesting and content-rich destination in Hyrule Warriors: Definitive Edition is Adventure Mode. Adventure Mode places you on Zelda series inspired 8-bit maps where completing missions successfully with high grades opens up adjacent squares on the grid. The goal is to reach the square on the map where the dark ruler of the map is situated, and taking them out in battle to clear the map. Of course, there is a lot more to discover than just clearing grid spaces to make your way to the dark ruler. 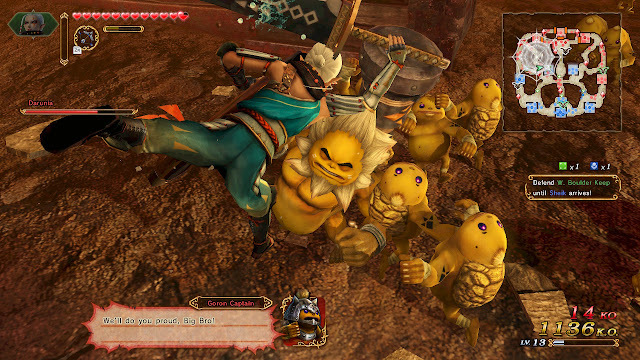 As stated, Adventure Mode maps contain the most content in Hyrule Warriors: Definitive Edition, and that's because by completing missions with "A" ranks as well as finding character-specific treasure chests, you unlock new weapons, costumes, characters, health-increases via Pieces of Heart and Heart Containers, and more as rewards. It's absolutely addicting to continually unlock new content through normal play, and with eight Adventure Mode maps to fully explore, you won't be starving for battles to engage in. a cool crowd control move such as this one from Lana. Adventure Mode improves upon Legend Mode as the former is not just a collection of keep-capturing and enemy-annihilating. 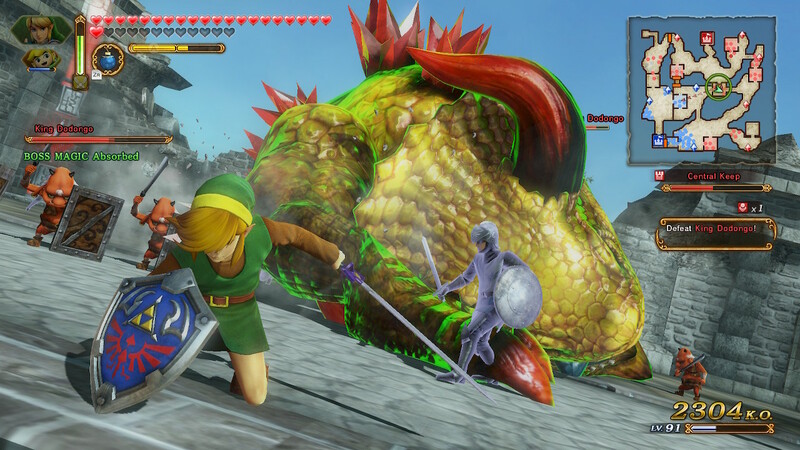 Adventure Mode's missions run the gamut from quizzes where you take out the correct foe based on the question posed, to battles against three giant bosses like the fire-breathing, bomb-hating King Dodongo; the aerial dragon from Twilight Princess Agorok, or the most hellish giant boss of them all, the Imprisoned of Skyward Sword fame. It can be mighty challenging to earn "A" ranks for rewards on these missions, but now that the Switch version has more manageable and gracious requirements for "A" ranks (especially in the damage taken department), these are much less of chores. Shot through the heart and Zelda's to blame. Moblin gives his forces a bad name. 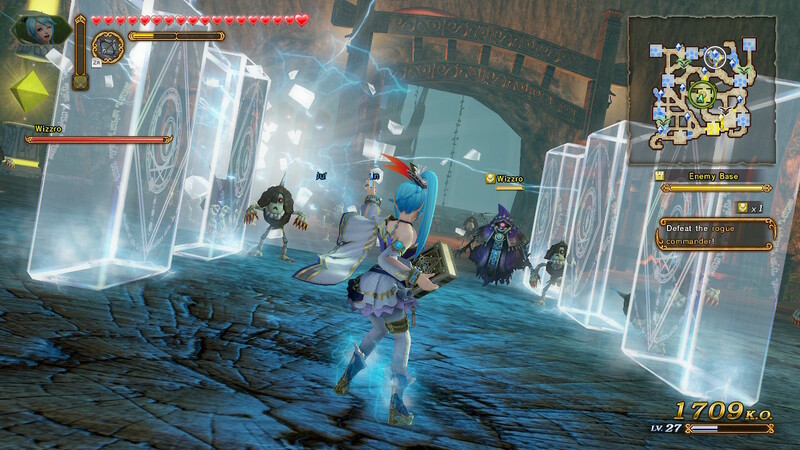 Speaking of chores, one of the biggest problems with the original Adventure Mode in both Hyrule Warriors and its Legends incarnation was that grinding for item cards was such a chore. Item cards allow you to discover secrets along the Adventure Mode maps, which in turn allow you to earn the reward for that particular grid square. The Nintendo Switch version remedies this with an insanely helpful ability to press the Plus button on the right JoyCon to bring up a shop where you can purchase any item card you've already collected in the past on that given Adventure Mode map. It's such a welcomed feature that I wondered why the heck it wasn't included in the original game to begin with! Furthermore, another impressive improvement to Adventure Mode as well as numerous levels in Legend Mode and Free Play is the ability to switch between characters on the fly, something introduced in Legends on the Nintendo 3DS, but available in this definitive version as well. It's a twofold benefit: 1) For Adventure Mode map spaces with two rewards for two different characters, you can switch between characters to acquire their awards in battle, and 2) It allows you to cover more ground without all the frantic backtracking to save bases. Additionally, you can command captains to different areas in missions, making it so you don't have to babysit everyone or every base on the battlefield all the time. While one character takes on the enemy's offensive on the allied base, you can capture some keeps. 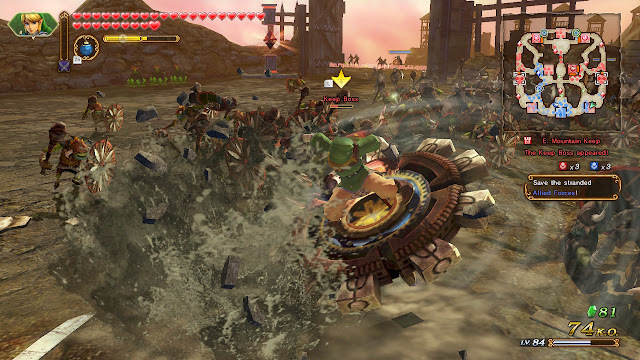 For days when Link's legs are just too tired, he takes his Spinner out for a spin. The creativity with weapons and moves in Hyrule Warriors is phenomenal. This is even better realized through cooperative play with two players locally on one Switch. This makes most missions much more manageable with the addition of splitting up tasks between players. In certain Adventure Mode missions, one player can choose a weaker character that relies on a much stronger, higher-leveled character in order to do the brunt of the work, all the while earning the rewards for the mission. Co-Op mode understandably contains less enemies on screen at one time for either player instead of a mass horde of enemy forces to bulldoze through like when playing solo, but that's to be expected. What isn't, however, is that strangely, Co-Op mode has to get activated with a click of the left stick before the beginning of every mission, which is a bit vexing, especially as sometimes I would forget to allow my older brother into the session by starting the mission before he had a chance to join in. Thus, I'd have to back out to the mission menu again and let him in. Why it couldn't just be turned on once and kept on for every mission so players wouldn't have to continually add a second player is anyone's guess. of enemies, racking up a big K.O. count in the process. Here comes the verdict, and the question many of you have probably been asking: If you've already played either or both versions of Hyrule Warriors, is it worth picking up the Definitive Edition on the Nintendo Switch? Well, yes and no. I annoyingly have to say, "It depends." If you're like me and have played both versions, but never downloaded the DLC, then heck yes, it is! There is still so much new content to be had here. If you already have invested hundreds of hours into unlock characters, costumes, weapons, and more in past Hyrule Warriors versions, then you can probably feel safe in passing on the Switch game. While small in stature, Toon Look makes a big impression on the battlefield. However, it's important to note that regardless of whether or not you jump into Hyrule Warriors: Definitive Edition, you can feel safe in buying it at full price. The Wii U version, plus all of the DLC, would run a given person way more than the asking price of the Switch game. Add in two exclusive Breath of the Wild costumes for Link and Zelda respectively and all the quality of life improvements of the game, and Hyrule Warriors: Definitive Edition scores high marks and a high K.O. count while it's at it. With a Pokemon Go-related tie-in, Nintendo, The Pokemon Company, and Game Freak announced Pokemon: Let's Go, Pikachu! and Pokemon: Let's Go, Eevee! These more casual-focused Pokemon titles take trainers old and new back to the Kanto region with all 151 original Pokemon, plus a brand-new one being teased. Pokemon: Let's Go, Pikachu! and Pokemon: Let's Go, Eevee! launch together on November 16th, 2018. Believe it or not, one of my most anticipated games currently announced for 2018 is none other than Mega Man 11, from a series that I've loved ever since I was a young'n. This trailer shows off some of the story elements, two new Robot Masters, and the inclusion of the all-new Double Gear system. What do you Mega Maniacs think about this trailer and Mega Man 11 in general? Featuring enemies taller than even Shaquille O'Neal, Attack on Titan 2 promises intense encounters with gigantic Titan monsters. Does it deliver? That's what the SuperPhillip Central review hopes to answer. 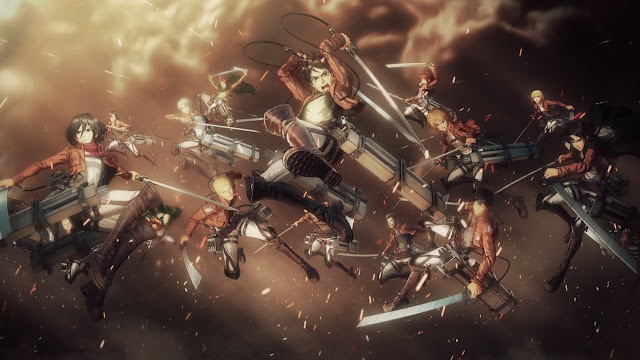 Attack on Titan 2 may leave fans of the previous game in the cold, as most might expect it to be purely a retelling of season two of the anime. In actuality, season two's story contents is reserved for the last quarter (if even that) of the game. 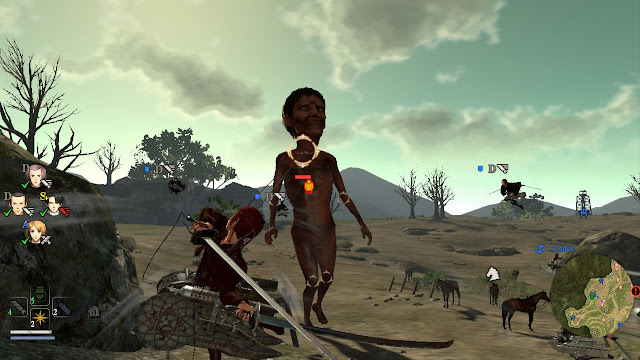 Instead, what players will find is that the bulk of the story-related content in Attack on Titan 2 is based off of the first season of the anime, which in turn, made up all of the content of the original game. 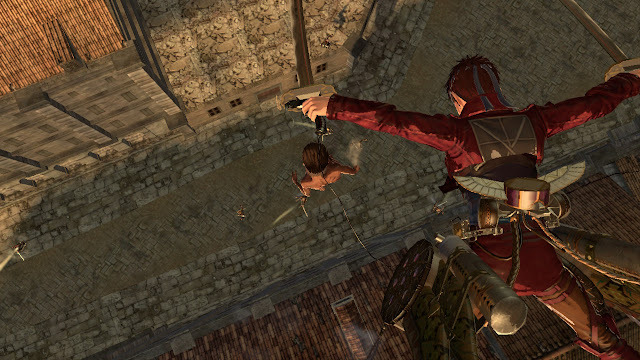 Even a large number of cutscenes in the first Attack on Titan game is recycled for the sequel. Still, what's here follows the anime very closely, and even if you're not a habitual watcher of the series, you can gather a grand idea of what's going on and every major happening in the anime by playing through the game. There is one caveat to this, and that's how slowly the story moves. The pacing is not quite perfect, making the story require several hours or so between major moments, which may put off plenty of players. However, the actual gameplay itself--though a bit repetitive, as I'll soon explain--encourages you to push forward and experience everything Attack on Titan 2 has to offer in its 10-15 hour story. Attack on Titan 2 sees you playing as a custom character serving alongside and interacting with the main characters of the anime. Many scenes play out in a first-person view in your character's perspective, really bringing a personal touch and sense of close involvement to them. You can even grow closer to your fellow squad members by participating in Persona-like personal events, which unfortunately don't have much to them other than giving you a choice of two to three responses to make, with one of those usually being the obvious choice to make for your "good guy" persona. Even further, these personal events occasionally are required in order to progress through the story of the game. They're not major annoyances, and they do earn you helpful battle skills through increasing your relationships with Attack on Titan's characters, but they do slow down the pace of the game overall. 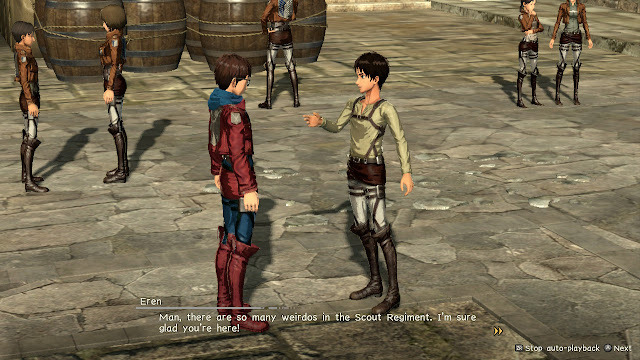 Don't be so sure, Eren. You haven't known my character for that long yet. Thankfully, outside of progressing the story and learning new skills, characters that you grow close to will have a higher proficiency with you in battle, and this is where Attack on Titan 2 shines. The battles aren't your typical Musou/Dynasty Warriors-style affairs where you unleash your blade upon hundreds of enemy fodder. Instead, you're taking on a smaller number of much bigger foes in the titular Titans. On easy difficulties, it's a simple as riding around in the air with your Omni-Directional Mobile Gear to maneuver yourself around a Titan's backside to perform a killing blow to their weak point, the nape of their neck for an instant kill. Of course, you need enough speed and proper timing to effectively slay a Titan in one slice. There is also the ability to perform a sneak attack on Titans by holding onto one of the shoulder buttons and keeping them in your sight until a target shows up. Performing a sneak attack requires exact timing to score a perfect kill, and you need to stay aware of nearby Titans. In preparation for sneak attacks, you're vulnerable and can also anger nearby Titans more easily. Angered Titans in rage mode are much more dangerous creatures than they are normally, and have no qualms in grabbing you, preparing to scarf your character down. An attack from above is sure to give this particular Titan an untimely end. On harder difficulties, it's better to target a Titan's limbs, slashing them off one by one to weaken them. Targeting is as simple as locking on to a part with a shoulder button, and then using the right stick to focus on your desired location to slice into them. Titans come in all forms: small, normal, and large sizes. The larger and rarer Titans require you to damage their glowing green weak point before you're able to do sufficient damage to their necks. in order to do a prominent amount of damage to them. Missions in Attack on Titan 2 come in similar varieties with simple objectives to complete. Sometimes you're escorting a character to a specific destination, while others you're defeating specially marked Titans on the radar map, or rescuing endangered squad mates on the battlefield from Titan threats. This is all the while speeding across the expansive maps by foot, by air (with the helpful grappling hook-esque Omni-Directional Gear), or by horse. Going from Titan to Titan, killing each that stands in your way, might sound a bit repetitive to some, and that's because... well, it totally is. The gameplay variety is limited here, and battles aren't the most fluid due to some occasional but obnoxious frame-rate issues which can slow battles to a crawl when a ton of Titans are at your position at once. Different types of Titans and some minor tower-bulding and tower-defense elements alleviate some of the ennui that can seep into the action sometimes, but for me, I had to play Attack on Titan 2 in bite-sized bursts, which was perfect for the system I played the game on, the Nintendo Switch. The aforementioned frame-rate issues aren't limited to Nintendo's newest home console either, as I've watched videos of both the PlayStation 4 and Xbox One versions as well, which also suffered from poor frame-rate when the action heats up. Fe-Fi-Fo-Fum, look out, Super, here this Titan comes! After the conclusion of a given mission, you're awarded with a rank based on your skill in battle. This depends upon how long the battle took you, how many Titans you've slain, and how many side-missions you completed. The best rank is an "S", and that rewards you with the best materials and money. I didn't like not being able to see what the required time limits, Titans to kill, and side-missions to complete were in order to gain an "S" rank, as I'd usually kill too few Titans in a rush to beat what ever target time was required of me, or waste too much time killing a lot of Titans that I was too slow to get an "S" rank in the time category. It was frustrating, as these missions take a good deal of time to complete. Sure, 10-15 minutes might not seem like a lot to many, but it adds up after subsequent retries and missions played. Coordinate with your squad mates to put Titans away more quickly. Materials are used in Attack on Titan 2 as a resource to create new weapons and gear. As you move through the game, more weapon and gear types will open up to craft, making your character even more powerful than usual than just by his or her increased experience level. Weapons and gear can also get upgraded to make them stronger, improving their abilities as well. Such stats that improve include how much gas they take with regard to gear, blade length with regard to weapons, among others. Though, as expected with a game with materials to collect, many times you'll find yourself replaying missions just to grind for specific materials to create that one weapon or piece of gear you have your heart set on. However, when you do finally get to create it, it makes for not only a mighty boost to your skills, but also it proudly displays itself in battle, which is a nice touch. By playing through the story mode, you unlock characters to play as in another mode in Attack on Titan 2, conveniently called "Another Mode". This mode allows you to choose from an exhaustive amount of characters from the show to take control of in non-story-based missions to increase their stats and abilities. Beating the story mode in general, unlocks a more difficult challenge in "Inferno Mode". This ultra hard mode follows the story mode of Attack on Titan 2, only with some minor changes along the way, ones that I won't spoil in this review. So, if you're worried about a lack of content, don't be--there's plenty to see and do in the game. Though, fans of Dynasty Warriors-style games probably already expected that. "Eliminate all the Titans." Sure. And after that, I'll rebuild this tower all by myself, too. Attack on Titan 2 may suffer from performance problems in heated battles, a slow-paced story, and reoccurring bouts of repetition, but generally speaking, I still found a lot to enjoy about the game. That's even without being a consistent watcher of the anime (and that's putting it lightly towards my total ignorance of the plot and characters of the show before playing this game). Attack on Titan 2 may not be Tecmo Koei's best offering, but it's certainly not the worst. 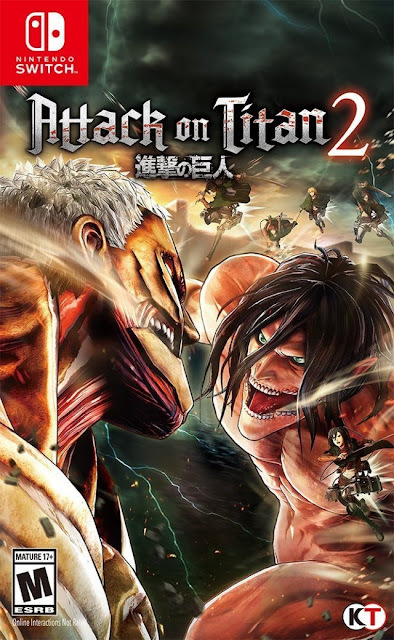 What we have here is a slightly above average interactive interpretation of the popular Attack on Titan anime series with enjoyably hectic, high-flying action with a dose of drawbacks, some of which are just as intimidating as the Titans in this game.